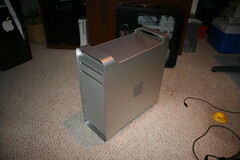 Sold my Mac mini on eBay, and my new Mac Pro arrived. Dual 3.0 Intel Xeon’s, and bumped it up to 2 gigs of ram from Crucial. I also dropped in a 10,000 rpm drive as the main boot drive. Nice job Apple, this thing looks and runs beautiful.